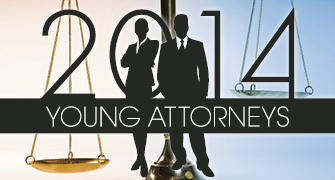 Congratulations to those who have been selected as one of San Diego's Young Attorneys for 2014. Thank you to all who participated in the nomination process this year. The Daily Transcript conducts a peer nominated process to determine the best young attorneys in San Diego County who are: Hard-Working & Detail-Oriented, Knowledgeable & Enthusiastic, Ethical & Professional, and Committed to Furthering the Interests of Justice in Society. Lawyers who have seven years of experience or less practicing law in private, public, contracts or Federal patent practice. Young Attorneys must be licensed in the State of California and/or the Federal Patent bench and must be in good standing with the California State Bar without any disciplinary actions leveled against them at any time in the past. E-mail invitations are sent to lawyers listed in the San Diego County Attorney Directory. Contact us to add or update your e-mail listing. Call-for-nomination notices are also advertised in The Daily Transcript in print and online. Yes, all nominations are accepted. Each nominator will be asked to nominate a lawyer (solo, in-house, firm, government) with whom they have had experience in a professional setting. We will need to collect information about each lawyer making the nomination and the person they are nominating. All nominees will be asked to submit their biographical information. The Daily Transcript will need the name, firm/company, phone and e-mail of each party. Each lawyer will be required to tell us why they are nominating the attorney in 500 words or less. All information provided will be kept confidential from the person they are nominating. The Daily Transcript reserves the right to contact any or all attorneys making nominations to verify the nomination. The Daily Transcript gathers all nominations for the judging process, where an independent panel selects the finalists. The Daily Transcript will publish a special publication called "Young Attorneys" in print and online. Each of the finalists will be profiled. Finalists will be contacted by The Daily Transcript to 1. alert them to the nomination; and, 2. collect biographical information.